Stealth technology is always fascinating to read about, and to be attacked by an “invisible” enemy is one of the greatest fears of any military. After all, this is the modern day water ninja – the GHOST marine platform that hails from New Hampshire’s Juliet Marine Systems (JMS). 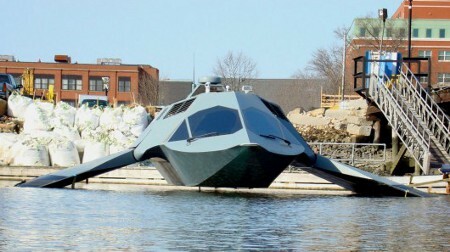 It does not have any special cloaking ability up to the par of the X-Men’s heavily modified SR-71 Blackbird, but what this particular watercraft does, and does well is this – it is invisible to enemy ships’ radar, effectively allowing it to trawl the country’s waterways while keeping threats away at bay. Resembling the love child of a stealth jet fighter and an attack helicopter, this one was specially developed for possible use by the U.S. Navy. It is touted to be faster and more economical compared to current military vessels, and according to JMS, GHOST is the world’s first super-cavitating watercraft. Now, super-cavitating is a pretty bombastic word to begin with, but fret not – there is always an explanation over here at Coolest Gadgets. Supercavitation basically involves an object surrounding by a bubble of gas, enabling it to pass through bodies of water in a near friction-less environment. Where GHOST is concerned, a couple of submerged buoyant tubular foils will get the job done. No idea on how the process works in detail, but logic dictates that the foils were specially designed in a manner that when GHOST’s gas turbines thrust it forward, water will be deflected outward at the front of each foil, hence the “envelope” which closes right behind it. JMS has high hopes for GHOST, stating that it “is a combination aircraft/boat that has been designed to fly through an artificial underwater gaseous environment that creates 900 times less hull friction than water.” No idea on whether that means 900 times less friction is created by GHOST, or is it a target that the company intends to achieve in the long run. A total of three crew can fit into the GHOST at once, and its main purpose is to patrol the perimeter of naval fleets. As for its weapons payload, it purportedly carries “thousands of pounds of weapons, including Mark 48 torpedoes” in an internal weapons bay.